This is Plaça Sant Felip Neri, a small and very quiet square in Barri Gotic, Barcelona. 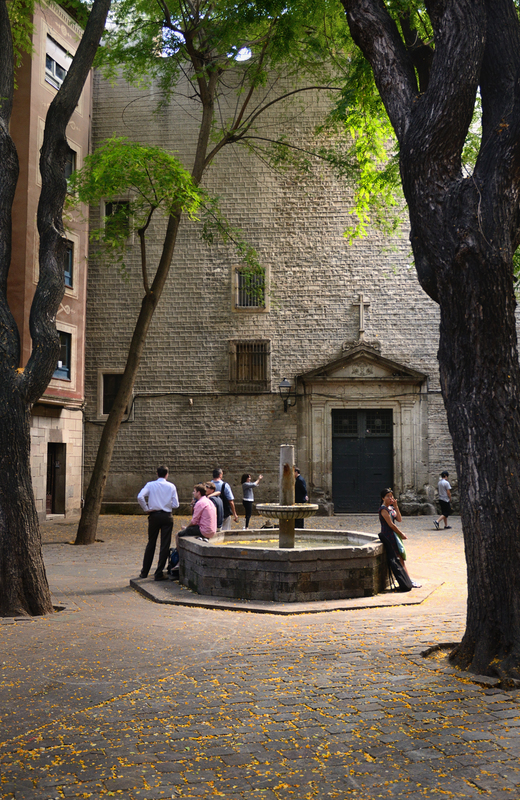 If you go up Carrer del Bisbe and take the narrow street on the corner of the archbishopric to the right, you will come across an archway that leads to this magical spot protected by leafy trees pierced here and there by beams of light that hit directly on the fountain you see in the picture (check location of Felip Neri square here). The place holds the church of the Congregation of the Oratory of Barcelona founded in 1673 by Oleguer de Monserrat, a priest that had been in touch with the Oratory of Sant Felip Neri during his stay in Rome. You should know that during the Spanish Civil War the square was bombed and the blast was so powerful that three houses, the church and the convent received considerable damage, up to the point that the iron doors of the church fell on the presbytery. This is one of my favourite spots in Barcelona. Some films and video clips have been shot there, for example, Perfume. The place is breathing the history. Great shot. This is such an interesting post and image. Thank you! I appreciate your kind words Elizabeth! lovely pic of a lovely place... would like to be back in Barcelona!